Unbeaten Inter Milan remain top of Serie A after a goalless draw with champions Juventus. Juve, who have won the past six league titles, would have gone top with a win and had the game's main chances. 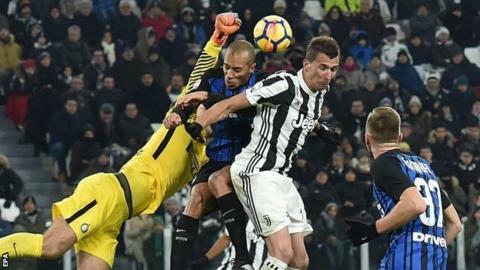 Mario Mandzukic hit the crossbar with a header, and forced a number of saves from Inter keeper Samir Handanovic. Serie A's top scorer Mauro Icardi was very quiet and Inter only forced one save from Wojciech Szczesny, who played because Gianluigi Buffon was injured. Napoli - who had topped the table until losing to Juventus 1-0 last weekend - can go top again if they beat Fiorentina at home on Sunday (14:00 GMT). Match ends, Juventus 0, Inter Milan 0. Second Half ends, Juventus 0, Inter Milan 0. Offside, Juventus. Giorgio Chiellini tries a through ball, but Mario Mandzukic is caught offside. Medhi Benatia (Juventus) wins a free kick in the defensive half. Rodrigo Bentancur (Juventus) wins a free kick in the attacking half. Foul by Éder (Inter Milan). Attempt blocked. Paulo Dybala (Juventus) header from the centre of the box is blocked. Assisted by Kwadwo Asamoah with a cross. Gonzalo Higuaín (Juventus) wins a free kick in the defensive half. Substitution, Juventus. Rodrigo Bentancur replaces Miralem Pjanic. Attempt missed. Marcelo Brozovic (Inter Milan) left footed shot from outside the box is close, but misses to the left. Assisted by Matías Vecino. Corner, Inter Milan. Conceded by Miralem Pjanic. Corner, Inter Milan. Conceded by Medhi Benatia. Attempt saved. Mario Mandzukic (Juventus) header from the centre of the box is saved in the bottom left corner. Assisted by Miralem Pjanic. Attempt missed. Gonzalo Higuaín (Juventus) right footed shot from outside the box is high and wide to the right. Assisted by Blaise Matuidi. Substitution, Juventus. Paulo Dybala replaces Sami Khedira. Attempt missed. Marcelo Brozovic (Inter Milan) right footed shot from the left side of the box is close, but misses the top left corner. Assisted by Miranda. Attempt missed. Ivan Perisic (Inter Milan) right footed shot from the centre of the box misses to the right. Assisted by Danilo D'Ambrosio. Attempt saved. Kwadwo Asamoah (Juventus) left footed shot from outside the box is saved in the bottom left corner. Offside, Juventus. Miralem Pjanic tries a through ball, but Gonzalo Higuaín is caught offside. Substitution, Inter Milan. Roberto Gagliardini replaces Antonio Candreva. Corner, Juventus. Conceded by Dalbert.